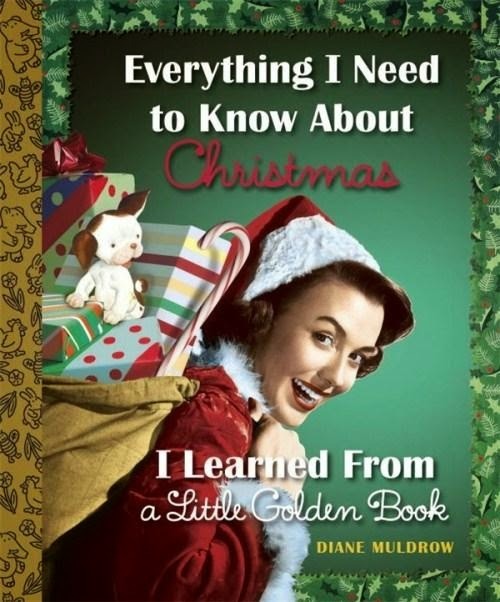 After the rip-roaring success (ah, nostalgia) of Everything I Need to Know, I Learned from a Little Golden Book, comes the festive version of the same, featuring glorious illustrations from the Little Golden Books of our recent and far distant past. Really made for adults, but absolutely something kids can utterly enjoy, this drily humorous retrospective will make adults chuckle in that Pixar-film-only-adults-get-it way. Each (totally PG) page features an illustration from a past Golden Book, ranging from the 1940s through to 2011. The variety of illustration is truly enchanting, and more than once, I was magically transported to my own childhood, as Little Bear and the Poky Little Puppy and the Naughty Bunny came to life. Illustration aficionados will be in rapture over such illustrators as Richard Scarry, Eloise Wilkin, Sheilah Beckett, Corinne Malvern, JP Miller and Gustaf Tenggren. A delightful, funny, whimsical tale about the vagaries of the festive season--and both the agony and ecstasy of this glorious time of year.